A Team Space is the cornerstone of the Catalyst environment. It is a secure work area with a user membership, governance structure, various types of content and libraries that all relate to that space. The user membership can be assigned admin, editor and view rights. Any user on the entire global Catalyst platform can be invited to a Team Space and provided with rights to view, edit, manage or administer content in that Space. A Team Space allows you – from a single login – to keep different operational divisions or clients separate. There are different levels of Team Spaces providing increasing capabilities (from Free to Pro, Enterprise and Unlimited). How should I use Spaces? If you are a large organization with multiple operating companies or divisions, you need to decide whether to manage everything in one Team Space - or have a space per division. DON'T think of a Space like a folder. You can control who can view or edit content within a Space. Most companies should have one operational Space. The main commercial model within Catalyst revolves around the level of the Team Space you are working with. There are various benefits and capabilities across the different levels. But from a setup, content management and governance perspective (who can see and do what) across a space depends on the level you are paying for. Free Space - anyone can share anything with anyone, invite new users and assign rights. No governance or controls on sharing or copying content. There are two other types of Space. As well as the Team Spaces you collaborate on with colleagues and clients, every user also has a default Personal Space. Think of your Personal Space as your Elements.cloud sandbox, where you can play with ideas, develop skills, and create new maps securely and privately. To share content with people, you need to create or be part of a Team Space. You can copy maps from your Personal Space to your Team Space and then share the specific Diagram or Map with other users. Otherwise simply create a new Team Space (or get yourself invited to an existing one in your organization. Any map you create is still visible only to you until and unless you decide to share with specific users or everyone in the space. Example Maps: this contains pre-built maps and ERDs. (You are already a member by default on registration). GDPR compliance: resources and processes to help users satisfy GDPR compliance. Salesforce.org Non-profit NPSP: contains example maps to help kickstart non-profits. Salesforce.org HigherEd (MockU): this is the MockU space connected to the official MockU Salesforce Org. MockU process and HEDA data model. Xenogenix: a Salesforce consulting firm that has made some of its content freely available. Any user can join a Public Space by going to "Spaces" page (left panel). Click on the PUBLIC tab at top of page. Select the space you are interested in. Click on "Join Space" in the right panel. Information on creating your own Public Space. Any user can create any number of Team Spaces. To create a Team Space, select the Spaces page on the left menu, and the NEW SPACE button on the top right bar. You change the Team Space you are currently working in on the Spaces page. Simply click on the Space in the list to switch to it. Remember – the maps, resources, data tables, Org Models, Ref Models and users all belong to a Space. So when you switch to another Space, you are looking at a different set of data. Once you have created the Space you can start inviting other users into the Space. This is from the right panel in Space list or from the Users page in the Space Management app, which you get to from the MANAGE SPACE button in the top bar. Users will NOT see any maps until you change the access rights on the maps. Note: If they are all Salesforce Users, you can automatically provision them to a Space. Install the Salesforce Integration managed package in your Org and it will provision and manage the users in the Space through Single Sign-on (SSO). The Space can have a mix of Salesforce provisioned users and those you have invited. If you pay for the Corporate IT Management licence, (see details here) you can also provision users across your entire landscape. If they are already a Catalyst user, they will get an email notification and a message on their Catalyst home page. If they are new to Catalyst they will get an email inviting them to register. If the Team Space is Pro, and you make them an Editor, then the Space will incur a cost. "All users with access can grant access" to allow any user with access to invite other users to this map as well as share diagram from it. Clearly you will not see these options in your Personal Space. You can also allow a Team Space member to edit or manage a map by clicking on the INVITE button. Only users who are have been set to Editor in the Space can be set to Editor for a map. If you toggle the “View” and “Copy” to off, the individual rights set via the INVITE button will still apply. Do I have a "Home Page" for each Space? No, you have a single Home Page, and the "Recently Viewed Diagrams" and "Diagrams I Follow’ which can be from any Personal, Team or Public Space. Can I share maps in my Personal Space? If I copy a Map from a Personal or Team Space, which Space does it go into? When you copy the map, you are asked to select from the list of Spaces that you belong to. Is there a limit to the number of Team Spaces I can create? Is there any downside to creating lots of Team Spaces? Potentially. Each Space has its own library of resources, data tables, reference models, etc. If you create lots of ad-hoc Team Spaces, you are then managing lots of moving parts and limiting the usefulness of analysis across your operation. This is why you should limit Team Space creation to situations where no existing Team Space has the right libraries, appropriate membership, or doesn’t represent the eventual audience of the content. Obvious example is consultants. You should have 1 space per client. Following this logic, you should have 1 space per client operation - not per project. Different maps can have different people accessing/editing them, but all the maps then share the same resource, data table and URL libraries (in Pro). Don’t forget that you can always share a map within a Team Space with a limited number of people, both inside and outside that Team Space. What would be an example of a requirement for a new Team Space? – Separating clients: If you are a consulting or services organization that uses Elements with multiple clients, then a new Team Space per client may be appropriate. – Confidentiality: Similarly, let’s say this is about a confidential reorganization or a brand new service launch. Even the blank data tables in the library or the resources appearing in the resource library might cause issues. In that case, a new Team Space ring-fences the libraries and the maps to only those who are involved. Once public, you can copy content into the operational main space, integrate with your other process content and either delete or archive your confidential project space. Can I choose any Team Space name? Yes, provided a Team Space of the same name is not already in use within your @domain. To change this, you need to be an Admin on the Space. Click on Spaces, select the Space you want to rename and change the name in the Details panel on the right. Can I change the name of a Team Space? Yes, provided a Team Space of the same name is not already in use within your @domain. To change, you need to be an Admin on the Space. Click on Spaces, select the Space you want to rename and change the name in the Details panel on the right. Can I delete a Space? Yes, you can delete a Team Space by selecting the Space and clicking on the three vertical dots in the right panel and selecting "Delete". You can only delete a Space if you are an Admin. You cannot delete your Personal Space. Given the impact of deleting a space, you must type in the name of the space to confirm that you are deleting it on purpose. Can every user in a Team Space create maps? No. You need to have the right to create maps in that specific Team Space. You can get that in one of two ways. 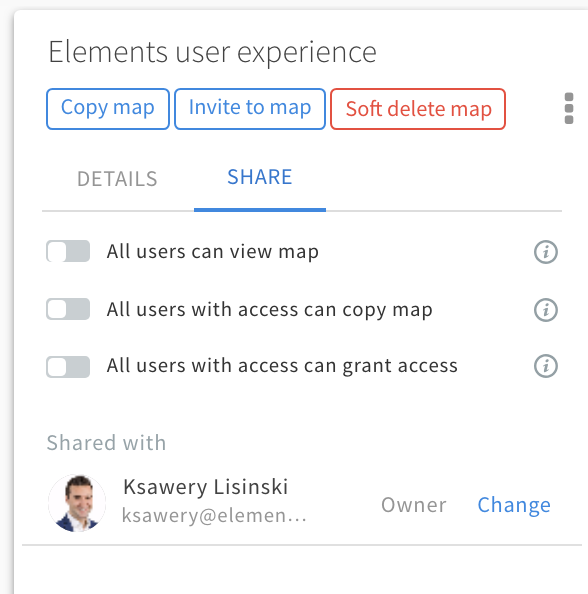 When a user is invited to a Team Space, the Admin can grant the user the right to create Maps. Alternatively, an Admin can select the user in the user list on that Team Space, and grant ‘Can Create Maps’ rights in the right panel. If you cannot contact an Admin for this Space, any user can create a map in their Personal Space, and copy them to the Team Space later. However, just because someone has create rights in one Team Space, it doesn’t mean that they can create a map in a different Team Space. Is there a limit to the number of users in a Team Space? Can every user in a Team Space edit existing maps? Yes – whether or not they have ‘Can Create Maps’ rights, a Map Manager can give any specific user (inside OR outside a Team Space), edit or manage rights to a given map. On the maps page (from Left Menu), select the map, click on SHARE on the right panel and invite the specific user. Once in, a Map Manager can change their rights (for that map), to edit or manage. If the Space is Pro, then you can only change the user to edit if they are set as an Editor for the Space. This is set in the Space Management app. This is because an Editor in a Pro Space has a monthly cost. Can every user in a Space see all the maps in that Space? No. The map owner sets the access rights from the SHARE tab for the map on the maps page. Can every user in a Team Space or Public Space see all the other users in the Space? Team Space – yes. Public Space – no. Only the Admins for the Public Space can see all the users. Who owns/controls a Team Space? The person who creates a Team Space is by default the Space Admin and the space inherits the "Primary Domain" from their email address. If they are the only admin and the primary domain is their company - then they 'own' it. However, it is transferrable. They can set other additional users to be an Admin, and any of those can update the primary domain (see video below). Can I change the Primary Domain for a Team Space? Yes. On the Spaces page, select a Space and the domain can be changed in the right column. Note, the domain can only be changed by an Admin who shares the same domain as the new primary domain name. How can I setup admin rights for someone to "take over" a space? Assigning admin rights is set on the users page in the Space Management app. It is quite usual for a consulting or third party organization to introduce a client to Elements as part of the work they are doing. In this case, the third party organization has often set up an initial Team Space. Over time, the client may well want to take over. In this case, they would have to nominate an Admin with an email in the client’s domain. That Admin can then go in and change the primary domain of the Team Space to that of the client. At this point, the client controls the Team Space, and whether the third party retains access to the Space and what rights they have. see above video snippet to change the primary domain. Can the Team Space Admin come from any organization? Is it easy to see which organization actually owns the Space? Yes. On the Spaces page the ‘Primary domain’ is listed on the right panel. On the users page in the Space Management app you can see the other users and their roles. Can I block users from a Team Space or Public Space? The Admin controls which users are invited, blocked and removed from a Team Space. So if you want to remove someone's rights to a space (maybe someone has left, or a consultant/interim who has completed their contract - or someone moving to a different role - as admin you can drive that from the user tab in Space Management. In a Public Space, since users are self-inviting, the Admin can only block users. Is there a limit on the number of maps in a Team or Public Space?